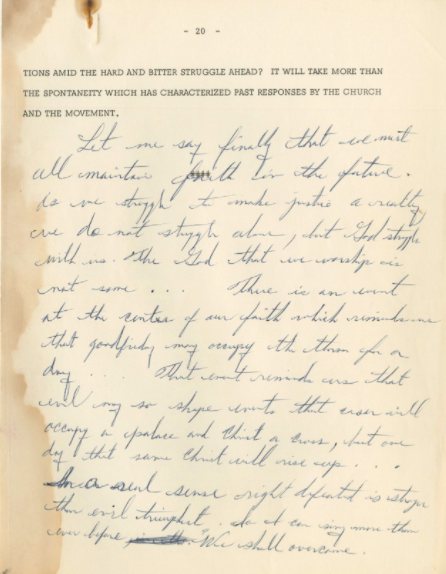 The original copy of Dr. Martin Luther King Jr.’s speech, “We Shall Overcome,” will be on display at the University of Memphis beginning Mon., March 26th. 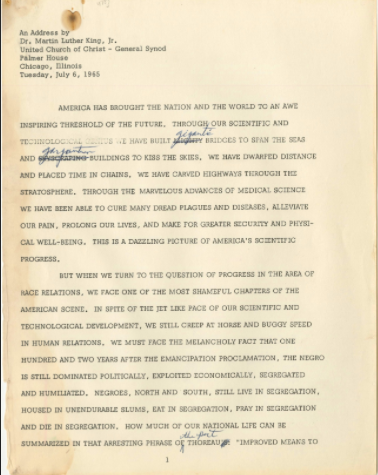 The speech, complete with King’s handwritten notes, will be in the McWherter Library rotunda until April 13th, and can be viewed for free on both weekdays and weekends during the library’s normal hours of operation. University president M. David Rudd said the administration is “honored and humbled to share this extraordinary artifact with our students and the greater Memphis community as we come together to observe the 50th anniversary of Dr. King's assassination." "Dr. King left an indelible mark on American history, and his impact is especially profound here in Memphis,” Rudd said. “We look forward to hosting a series of events and activities this spring that will honor Dr. King's legacy and help us reflect on the civil rights and social justice issues of today." King delivered the speech dubbed “We Shall Overcome” in Chicago to the General Synod of the United Church of Christ during the summer of 1965. The 20-page speech was purchased at an auction for $382,000 by Memphis philanthropist Avron Fogelman. "Growing up in Memphis, I had a special feeling for what Dr. King accomplished, so I was especially pleased to have the opportunity to own this iconic speech in which Dr. King first wrote the phrase most closely associated with the civil rights movement," Fogelman said. "This is the first time I have shared this speech with the public, and I'm delighted to share it with the University of Memphis for its month-long exhibit honoring Dr. King on the 50th anniversary of his assassination. I commend President Rudd for keeping the accomplishments of Dr. King alive for all of us."